"events strongly affect ozone at 60–80 km, leading to extremely large (up to 90%) short-term ozone depletion. This impact is comparable to that of large, but much less frequent, solar proton events. On solar cycle timescales, we find that EEP causes ozone variations of up to 34% at 70–80 km. With such a magnitude, it is reasonable to suspect that EEP could be an important part of solar influence on the atmosphere and climate system." "On solar cycle scales, we find that EEP causes significant ozone variations of up to 34% at 70–80 km. As ozone is important to atmospheric heating and cooling rates, this level of ozone variation could significantly affect the local mesospheric temperature balance6. Our results emphasize the importance of the EEP effect on mesospheric ozone and significantly improve our understanding of the impacts of the energetic particles on the atmosphere." "Most studies have concentrated on the so-called indirect particle precipitation effect caused by the production of odd nitrogen (NOx) in the polar upper atmosphere, its subsequent transport to lower altitudes inside the wintertime polar vortex, depletion of ozone in the stratosphere and effects on the radiative balance of the middle atmosphere10, 11, 12, 13. These effects may further couple to atmospheric dynamics and propagate downwards by changing polar winds and atmospheric wave propagation through wave—mean flow interaction14, 15, 16. Several studies have suggested links between the EPP indirect effect on ozone and regional wintertime tropospheric climate variability." "Our results show that the direct, HOx-driven effect of EEP is causing significant, previously unaccounted for, ozone variability in the mesosphere that are observable on solar cycle timescales. Although these effects from EEP-HOx have not been considered in atmospheric and climate models to date, dynamical changes in the mesosphere and stratosphere have been reported as a result of SPEs and the indirect EEP impact on ozone19, 21." "Considering the magnitude of the direct ozone effect, tens of percent in wintertime polar regions, it is reasonable to suspect that EEP could be an important contributor to the Sun-climate connection on solar cycle timescales. For comparison, the 11-year variability in UV radiation has a less than 10% effect on annual mean mesospheric ozone at mid-to-low latitude22, 23, 24. Thus, more research should be directed towards better understanding the potential further effects from EEP and its role in the overall Solar influence on climate. Currently, in most high-top climate models the solar input does not include EEP and it is completely missing from low-top models." In addition to the large effects on ozone as a potential solar amplification mechanism, this paper begs the question how much of the alleged ozone hole over Antarctica is related to solar activity vs. man-made CFCs? As this paper notes, these solar effects on ozone are most pronounced over the poles where the Antarctic ozone hole is located. In addition, the wide variations in the Antarctic ozone hole from year to year indicate solar activity is more likely responsible rather than a continuous effect from CFCs. Is this why no significant trend in the ozone hole has been found now 30 years after the Montreal Protocol to outlaw CFCs? Energetic electron precipitation (EEP) from the Earth’s outer radiation belt continuously affects the chemical composition of the polar mesosphere. EEP can contribute to catalytic ozone loss in the mesosphere through ionization and enhanced production of odd hydrogen. However, the long-term mesospheric ozone variability caused by EEP has not been quantified or confirmed to date. Here we show, using observations from three different satellite instruments, that EEP events strongly affect ozone at 60–80 km, leading to extremely large (up to 90%) short-term ozone depletion. This impact is comparable to that of large, but much less frequent, solar proton events. On solar cycle timescales, we find that EEP causes ozone variations of up to 34% at 70–80 km. With such a magnitude, it is reasonable to suspect that EEP could be an important part of solar influence on the atmosphere and climate system. Energetic electron precipitation (EEP) from the Earth’s outer radiation belt continuously affects the chemical composition of the mesosphere across the geomagnetic latitudes 55–65°. 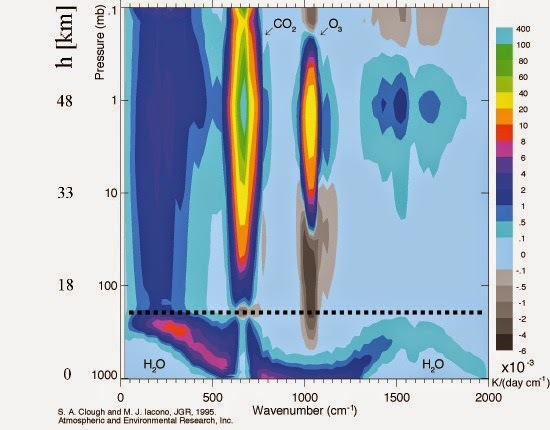 At altitudes below ~80 km, EEP leads to odd hydrogen (HOx) enhancement following ionization and ion chemical reactions1, which is expected to contribute to the ozone balance in the mesosphere. A recent study considering the 2004–2009 period concluded that EEP was significantly affecting mesospheric HOxaround 35% of the time2. A set of case studies has demonstrated that EEP-HOx is expected to have a short-term effect on mesospheric ozone through well-known catalytic reaction chains3. The largest effects of EEP on HOx have been reported at 70–80 km, caused by electrons with energies between 100 and 300 keV. The EEP effect is most significant during and following geomagnetic storms, where dynamic processes inside the radiation belts accelerate electrons to high energies. Here we show, using ozone observations from three different satellite instruments, that EEP events very strongly affect ozone at altitudes between 60 and 80 km. The EEP leads to an extremely large (up to 90%) short-term (days) ozone depletion in the atmosphere. The magnitude of these short-term effects is comparable to those caused by large but much less frequent solar proton events4, 5. On solar cycle scales, we find that EEP causes significant ozone variations of up to 34% at 70–80 km. As ozone is important to atmospheric heating and cooling rates, this level of ozone variation could significantly affect the local mesospheric temperature balance6. Our results emphasize the importance of the EEP effect on mesospheric ozone and significantly improve our understanding of the impacts of the energetic particles on the atmosphere. Solar cycle 23 (SC23) was one of the longest cycles since 1847 and exhibited large variation in solar (UV radiation) and geomagnetic activity (solar storms, energetic particle precipitation). In 2003, during the declining phase of SC23, the majority of the days were geomagnetically disturbed. In contrast, the deep solar minimum that occurred in 2009 showed the lowest activity since the beginning of the Twentieth century. The current solar cycle (SC24) is so far the weakest cycle in the last 100 years. For this period, EEP events were strongest and most frequent during the transition between SC23 maximum and the following minimum (Fig. 1a). Almost 75% of all major EEP events (major=daily mean electron precipitation count rate exceeding 150 counts s−1) in the 2002–2012 period occurred between 2003 and 2006. The occurrence of solar proton events (SPEs) peaked during high solar activity (red numbers in Fig. 1a). Figure 1: Signature of EEP in observed mesospheric ozone. (a) Monthly mean ECRs (black bars), maximum proton flux >10 MeV (red numbers) in proton flux units (1 pfu=1 p cm−2 sr−1 s−1) and sunspot number (SSN, grey area) between 2002 and 2012. (b,c) Maximum O3loss (%) at altitudes between 70 and 78 km in the Northern hemisphere (b) and Southern hemisphere (c) during 60 EEP events, with daily ECR >150 (counts s−1). Numbers: the average O3 loss (%) for each set of available satellite measurements (MLS, SABER and GOMOS). Figure 2: Magnitude of the short-term EEP effects on mesospheric ozone. (a–c) O3 anomalies (%) for selected EEP events in the Northern hemisphere and in the Southern hemisphere derived from GOMOS (a), SABER (b) and MLS (c) observations. Black dashed lines: EEP event start end end; red dashed lines: SPE event start end end; black numbers: daily mean ECRs; red numbers: >10 MeV pfu. (d–i) Superposed epoch analysis for EEP events with daily ECR >150 (counts s−1) showing ozone anomalies (%) and ECR (black lines) in the Northern hemisphere (d,f,h) and in the Southern hemisphere (e,g,i). White numbers: O3 loss at different altitudes. In recent years, the atmospheric effects of energetic particle precipitation (=EEP+SPE) have received a considerable amount of scientific attention. Most studies have concentrated on the so-called indirect particle precipitation effect caused by the production of odd nitrogen (NOx) in the polar upper atmosphere, its subsequent transport to lower altitudes inside the wintertime polar vortex, depletion of ozone in the stratosphere and effects on the radiative balance of the middle atmosphere10, 11, 12, 13. These effects may further couple to atmospheric dynamics and propagate downwards by changing polar winds and atmospheric wave propagation through wave—mean flow interaction14, 15, 16. Several studies have suggested links between the EPP indirect effect on ozone and regional wintertime tropospheric climate variability17, 18, 19, 20. Our results show that the direct, HOx-driven effect of EEP is causing significant, previously unaccounted for, ozone variability in the mesosphere that are observable on solar cycle timescales. Although these effects from EEP-HOx have not been considered in atmospheric and climate models to date, dynamical changes in the mesosphere and stratosphere have been reported as a result of SPEs and the indirect EEP impact on ozone19, 21. Considering the magnitude of the direct ozone effect, tens of percent in wintertime polar regions, it is reasonable to suspect that EEP could be an important contributor to the Sun-climate connection on solar cycle timescales. For comparison, the 11-year variability in UV radiation has a less than 10% effect on annual mean mesospheric ozone at mid-to-low latitude22, 23, 24. Thus, more research should be directed towards better understanding the potential further effects from EEP and its role in the overall Solar influence on climate. Currently, in most high-top climate models the solar input does not include EEP and it is completely missing from low-top models. Scientists have been able to confirm, for the first time, the long-term implications of solar-driven electron impact on the upper middle atmosphere ozone. The increase in greenhouse gases explains, to a large extent, the rise in the average temperature of Earth. According to the research study published in Nature Communications today, the Sun affects middle atmosphere ozone with potential implications on smaller scale to regional, but not global, climate. Humankind is responsible for the global warming of our climate by increasing the amount of greenhouse gases in the atmosphere. However, according results published today, fluctuations in the activity of the Sun impact middle atmosphere ozone, providing a potential link to regional scale climate variability. This climate variability is not a trend, like climate change, but rather year-to-year fluctuations following solar activity. "The detected ozone variation may in part help understand the alternation of local mild and cold winter seasons, as hints have been obtained in previous research that the ozone changes in the middle atmosphere may link as far as the surface of Earth and affect, among other things, polar wind streams," Finnish Meteorological Institute researcher Dr Pekka Verronen reflects. The research team was able to confirm, for the first time, the long-term implications of solar-driven electron impact on the upper middle atmosphere ozone. The results showed strong effects in the polar latitudes. The amount of ozone at 70-80 km altitude was found to vary more than 30 percent during a solar cycle, a period of approximately 11 years. The ozone variation between the extremes of the Sun's activity is so great that it is likely to impact the temperature balance of the atmosphere. These temperature changes can in turn have an effect on atmospheric winds. According to the research study conducted by the Finnish Meteorological Institute, University of Otago and the British Antarctic Survey, the electrons, similar to those behind the aurora, cause significant solar cycle variation in the polar mesosphere ozone. The amount of ozone is smaller when more electrons enter the atmosphere. "These results are only the first step but an important one, allowing us to better understand the long-term impacts of this type of solar activity, and its role in regional climate variability," says Dr Monika Andersson who lead the study at Finnish Meteorological Institute. Earth's radiation belts are regions in near-Earth space that contain vast quantities of solar energetic electrons, trapped there by Earth's magnetic field. During magnetic storms, which are solar wind-driven, the electrons accelerate to high speeds and enter the atmosphere in the polar regions. In the atmosphere, the electrons ionize gas molecules, leading to the production of ozone-depleting catalyst gases. Based on currently available satellite observations, electron precipitation may, during solar storms lasting a few days, reduce ozone in the upper atmosphere (60-80 km) as much as 90 per cent on a momentary basis. The above story is based on materials provided by Finnish Meteorological Institute.Note: Materials may be edited for content and length. "The sun causes latitudinal climate zone shifting with changes in the degree of jetstream zonality / meridionality by altering the ozone creation / destruction balance differentially at different height above the tropopause. The net result is a change in the gradient of tropopause height between equator (relatively high) and poles (relatively low). That allows latitudinal sliding of the jets and climate zones below the tropopause leading to changes in global cloudiness and albedo which alters the amount of energy getting into the oceans." I have been pointing out for some time that the reverse sign effect of solar variation on ozone in the mesosphere (less ozone when the sun is active, more ozone when it is inactive) works down through the polar vortices to affect tropopause heights above the poles relative to the heights above the requator and thereby influence jet stream meridionality, global cloudiness and the proportion of solar energy that is able to enter the oceans to fuel the climate system. This paper says that the reduction in ozone occurs most when the sun is active, just as I proposed. That reverse sign ozone response is the distinguishing feature of my New Climate Model and they appear to have confirmed it. Have you created computer code of your model to try hindcasting/projecting? No, that is beyond my capability but you can hindcast and project from my simple conceptual model by running through the sequence of real world events and comparing to the sequence set out in my model. Applying the sequence works well right back to the Maunder Minimum and accounts for observations during the recent 'pause'. Also note the sections about falsification and predictive skill. include the charged electrons referred to in this new paper.